Maggie (10) has a big project due at school, one part of which requires that she build a model Aztec temple. I think. When she first asked for help getting started, I suggested that she build a frame out of Popsicle sticks & then cover that with air-drying clay. I thought I was quite clever. She thought that was dumb. 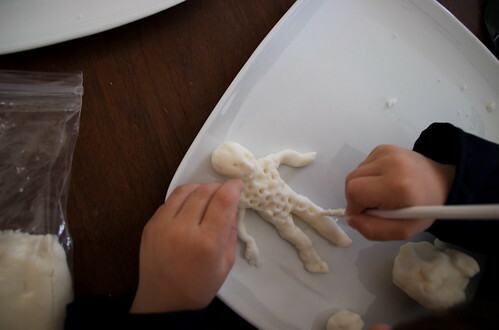 So… off to the internet I turned & I found what looked like a neat idea – we’d make our own no bake clay! I was working, so I printed off a copy & told Maggie about it, letting her know we could make this together when I was done with work. I didn’t get too much of a reaction from her but when I wrapped up my work I found her in the kitchen, busy with measuring out all her ingredients. This recipe from Education.com is wonderful & super easy, but you do need to cook it — a detail I’m kind of happy Maggie missed while I was unavailable because this part does need a bit of adult supervision. My girl hasn’t gotten ’round to building her temple yet, but in the meantime, Tor (3) has had a blast building & destroying his own (and others’) creations. Over and over again. We’ve kept ours plyable by storing it in a ziplock bag. To dry it out (thus the “no bake”), you just leave it out over-night. Love this idea – will give it a go!